It's a good start for the person-to-person lender, running about 25% to 30% ahead of our projections made when the company launched (see Online Banking Report #127). However, they are a long way away from profitability, booking just $200,000 in loan fees during the first nine months, plus less than $50,000 in servicing fees and some pocket change in late fees, which are shared with lenders. The company may need to consider hosting advertisements to prop up the bottom line. With high CPMs in the loan and personal finance market, Prosper could potentially make more on advertising than it does on the loan originations. Bank of America's $250+ premium: richest ever? Bank of America is offering $250 for new customers willing to open a checking and savings account. And customers willing to play the "Keep the Change" debit-card game could easily rack up another $20 to $50 or more in freebies with the bank's three-month, 100% match (bonus averages $0.50 per debit card transaction). See our previous coverage here. Wow! Even adjusting for inflation, that's about 10x the free toaster deal of the 1960s. Here's the link (screenshot below). There is only one "catch" to the offer. It applies only to consumers outside the bank's sprawling branch network; however, we were able to see the offer no matter what state we entered into the initial screen. But as long as you live in Nebraska, North Dakota, or other non-BofA states, it's very easy to earn the $250. Just drop $100 in savings and $25 in checking and the bank will triple your outlay. There's no direct deposit or online bill payment requirement, the norm for most online offers. However, the MyAccess checking account is only free if direct deposit is used, otherwise it costs $5.95/mo. Credit for first posting the offer goes to SlickDeals.net. We saw it first at BankDeals. 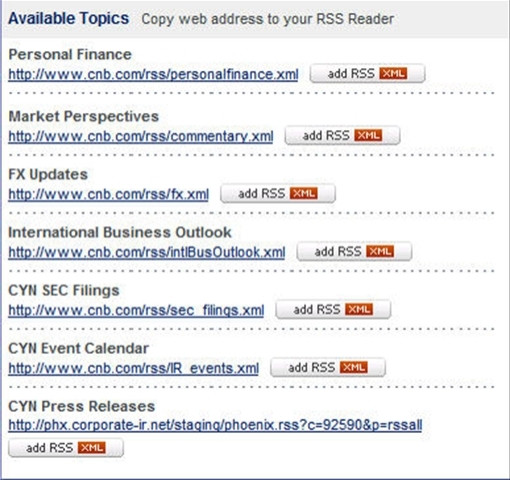 We are starting to see RSS feeds used at public financial institutions, primarily to keep shareholders up-to-date on new filings and press releases. One bank in front of the curve is Beverly Hills-based City National Bank <www.cnb.com>. 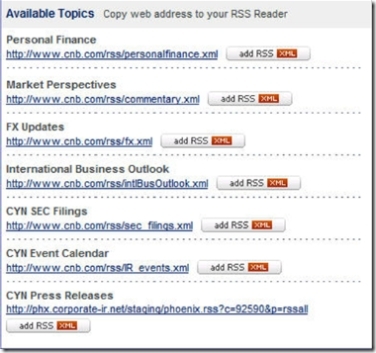 The bank has seven RSS feeds and three podcasts (see below). They've even added an RSS feed button on the bottom of most website pages (see End Notes). The podcasts are just read-throughs of the articles. That's OK, but the bank should let customers know not to bother subscribing to both. The newsfeeds are geared primarily towards business users (2 feeds) and shareholders (3 feeds), but there's also a Personal Finance feed and a Market Perspectives feed. The bank has published three Personal Finance articles so far: the first on Aug. 16; another two weeks later on Aug. 30; then, after a two-month hiatus, a third one today. 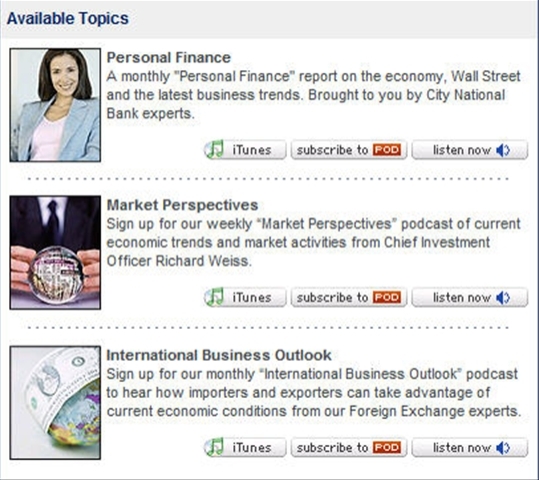 The bank is also podcasting more thoroughly than we've seen before, with not one but two monthly podcasts: personal finance and international business. The company also produces a weekly market perspectives podcast (see list below). 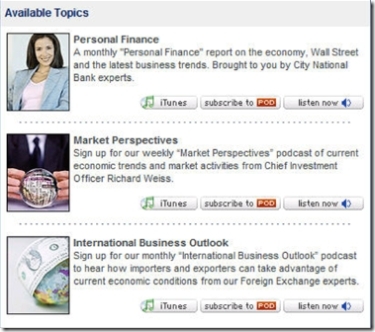 Users can subscribe to the audio reports via a newsfeed (RSS) or directly into Apple's iTunes using the appropriate button. *Preliminary forecast. See the final forecast numbers in our upcoming report, Online Banking Report #135, Web 2.0-itizing your Bank (to be published in early November). 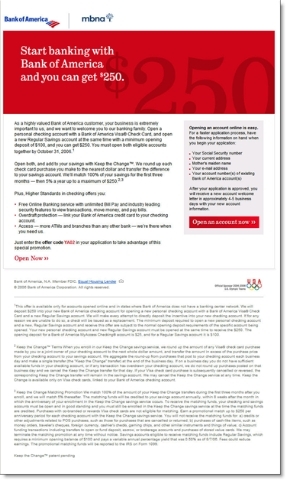 If you thought it was tough competing with the direct banks and their 5% savings products, now you have a legitimate company advertising rates of 8% or more. 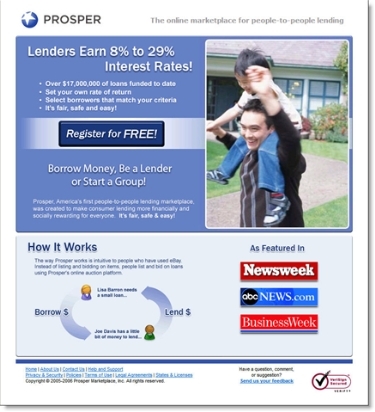 Of course, this is no FDIC-insured product; it's the interest rate paid to lenders at Prosper's person-to-person loan marketplace (see previous coverage here). The person-to-person lender was bidding aggressively today at Google on both "high yield savings" and "online banking." The ads typically made the fourth position in the right-hand column, putting them "above the fold" (see inset). The company is testing three different ads, all focused on rate levels substantially higher than the 5% to 5.5% advertised by the competition. Prosper is testing a straight up "8%" ad, an "8% to 12%" ad, and an "8% to 29%" one (see below). Or the more "Web 2.0" version that no one will confuse with a bank ad. There is even a small eBay logo visible in the screenshot (used by one of the participants seeking to bankroll an eBay store), a smart touch for a company that is positioning itself as "the eBay of lending." All-in-all, it's a good effort put forth by Prosper, which can only succeed if it attracts enough money into the marketplace. For more information on Prosper, Zopa, and the entire person-to-person market, see Online Banking Report #127. Mortgagebot LLC, the online mortgage spinoff from M&I, has introduced an online widget for its clients (see Fairwinds CU version inset). The widget allows users to keep current mortgage rates visible on their desktop. Typically, it would appeal primarily to someone currently in the market for a mortgage or refi where an 1/8 difference in rate can add up to thousands over the life of the loan. So far, seven of Mortgagebot's 600 clients have posted the widget at Yahoo's widget center; however, many more offer the service through their websites. 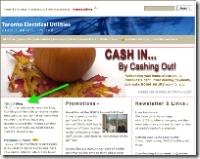 The first widget posted on Yahoo was uploaded Aug. 28 for Northwest Savings Bank and has been downloaded 711 times. In total, the Mortgagebot widget has been downloaded 2,200 times. For more information on creating a desktop presence, read Online Banking Report #85, Grabbing Desktop Mindshare. Also see our previous coverage here. There seems to be a new announcement every day about a bank or credit union intent on stalling this or that security solution to comply with the FFIEC's year-end guidelines (see previous coverage here). However, if you drill-down through the press releases, usually initiated by vendors, details are sketchy. In fact, according to the Glenbrook Partners in-house security wizard, Linda Elliot, only 26 U.S. financial institutions have disclosed specific security solutions from a total of 13 vendors. Her most recent scorecard, as published in the consulting company's Payments News, is here. 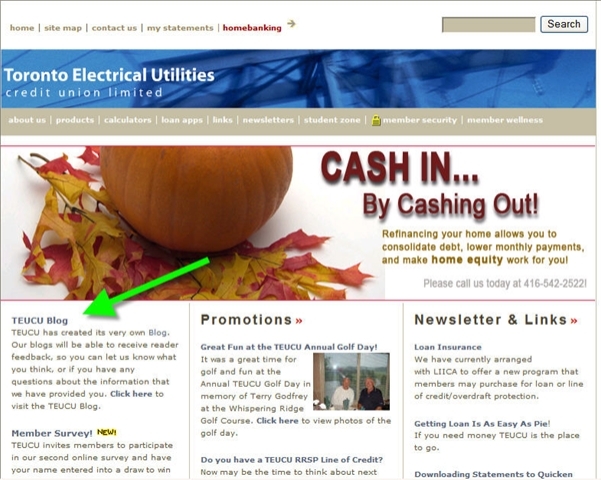 Toronto Electrical Utilities Credit Union <teucu.com>, the ninth North American financial institution blog, and third in Canada, debuted Aug. 15 at <teucu.ca/blog>. The other eight are listed here. The CU has done a reasonably good job keeping the blog alive with 11 posts in its first two months. The posts have been all business, ranging from notice of an ATM service interruption to a discussion of loan options. The CU allows comments, and so far 13 have been posted. None were particularly interesting, mostly "thanks for the info." That will change as users understand what blog comments are for (i.e., furthering the "conversation" or adding some informational value). 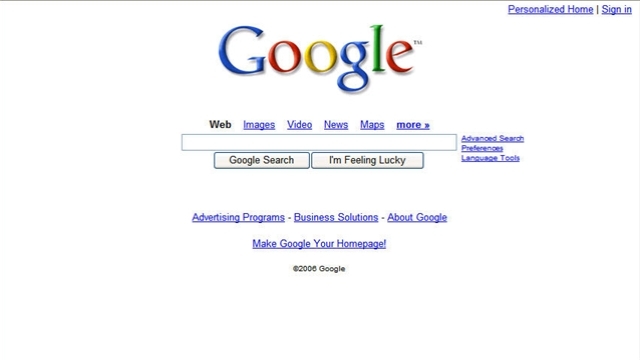 The blog runs on Google's free Blogger platform (see screenshot below). It's an OK start, but the CU should invest a few hundred dollars in upgrading the template as soon as possible. TEUCU publicizes the blog in a prominent spot on its homepage (see inset). Thanks to the guys at Trabian for the scoop. TrueCredit email: "credit is scary"
I'm a sucker for holiday-themed messages. There's something about a big, well-timed graphic that makes an email stand out from the crowd. 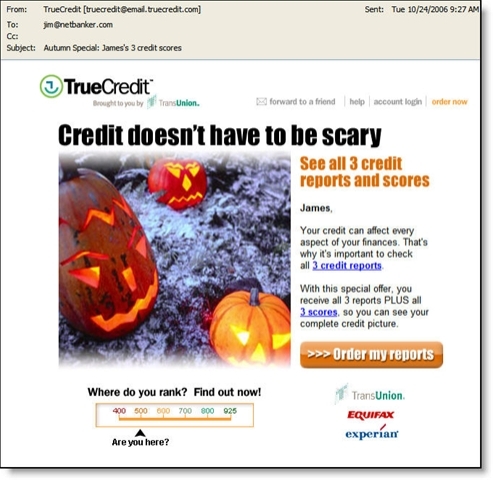 Here's the latest from TrueCredit, a prolific emailer to ex-customers such as myself. I usually hear from them every week or two. It's not often that a press release leads directly to a Netbanker post, but here's an example. 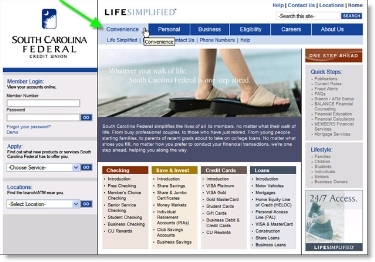 We received an announcement last week that South Carolina Federal Credit Union <scfederal.org> was launching a complete rebranding under the "life simplified" theme (press release here). 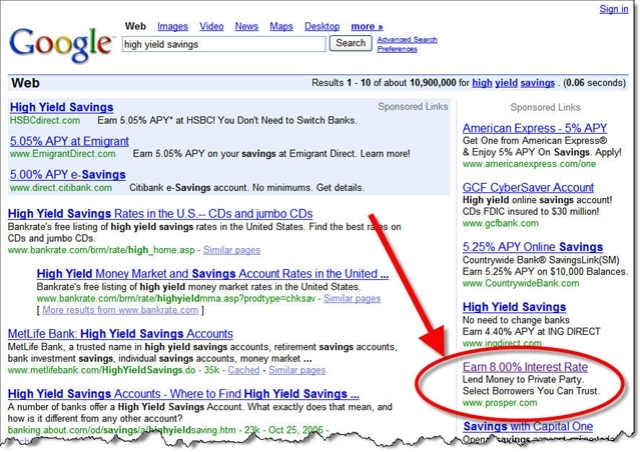 We eagerly headed to its homepage, expecting to find a site that did for banking what Google did for search. In other words, a website that instantly lays out the critical tasks for online banking customers. What we found was good, and light years ahead of its old homepage (see End Notes below), but it was not revolutionary. The homepage design follows most best-practices including the left-hand log-in area, tabular main navigation, and site search and other utilities in the upper right. The first navigation tab is Convenience. That's an unusual choice that could help the CU differentiate its member benefits. However, the laundry list of electronic and online banking features cited have been industry standards since 1997. Website visitors are not going to walk away thinking "that credit union really saved me time." If anything, the homepage is somewhat cluttered with 80 hyperlinks, many in small type, plus another dozen or so in two lefthand, drop-down boxes. Five choices are simple (see Google above). Eighty are not. The credit union missed a great chance to build a website that clearly directs users towards what they most want from their credit union: online access, customer service, and research. Person-to-person lender, Prosper, announced its first annual user meeting next February in San Francisco. Registration is a refundable $25 and includes an all-day session with dinner on Monday, Feb. 12, and a half-day on Tuesday, Feb. 13. The agenda has not been published. Online signup is here. The October newsletter (see End Notes for screenshot) also announced the arrival of the group ratings, an important milestone for the nine-month-old service. Group ratings promise to help lenders locate borrowers with better-than-expected likelihood of repayment. 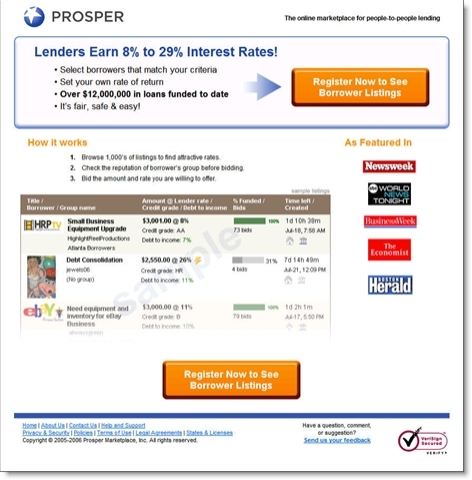 If it works, Prosper could become a major force in consumer lending. If it doesn't, the company will have to find another way to beat the loan default odds. For prior coverage of Prosper and its U.K. rival Zopa, look here.